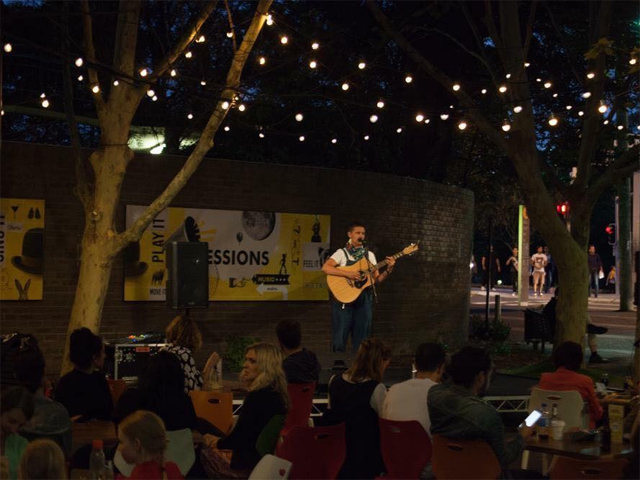 The Courtyard Sessions will be returning to Sydney's Seymour Centre next month, with 8 nights of free music under the setting sun, in the Seymour's leafy courtyard. Ease into the weekend and enjoy everything Sydney has to offer at Courtyard Sessions 2019 – long days, warm weather, good food, cold drinks and great live music. Courtyard Sessions' free gigs at dusk have become a staple in the city's live music scene, known for the diversity and energy of programming - with free performances to help close out the work week. The series will kick off on Friday 8th February at 6pm with Caitlin Harnett, who hails from Sydney but produces myself more attuned with Laurel Canyon circa 1970. Combined with her guitar, banjo and harmonica, her songs have the lilt of folk, a touch of pop and the honesty of Americana that have taken the talented artist all over the world. We're thrilled to have her back in Sydney on the Courtyard Sessions stage to launch our 2019 programme. The following week, emerging local trio St Joan are set to impress. The group - comprised of Daniel Tomalaris, Alasdair Belling and Chris Paine - craft music that navigates the contours of the listener's heart, their pains, trials and joys. The 2019 programme will also include 4 performances as part of the Sydney Gay and Lesbian Mardi Gras, which kicks off on Sunday 17th February with Fair Day. As part of those festivities, Tanzer will hit the Courtyard for a special DJ set from 4.30pm to 7pm featuring special guests, Drag Superstars Betty Grumble and Aaron Manhattan. The series will continue across two weeks, with Kim Sheehy, Liam Gale and the Ponytails and UK duo Z-Star Delta. The sets will run alongside an extensive Mardi Gras programme which will be taking place inside the Seymour Centre. The 2019 schedule will then end with Alice Terry on 8th March and a secret headliner closing everything out on 15th March, which who be accompanied by a support set from one lucky artist from the AIM - The Australian Institute of Music. The Courtyard Sessions are proudly presented by the City of Sydney. The Courtyard Sessions are curated by Larry Heath of Heath Media. The Courtyard Sessions are located in the front Courtyard of the Seymour Centre, which is located at the corner of City Road and Cleveland Street in Chippendale, Sydney.